Transit agencies can have a hard time finding the money to expand rail lines and busways. While federal grants for road projects require a 20 percent local match, transit projects need to get 50 percent or more from local funding sources. The byzantine federal funding bureaucracy creates high hurdles, especially for smaller agencies without on-staff expertise in applying for and managing these grants. Loans and private sources of funds are also difficult, since they need to be paid back, and transit tends not to make back its capital outlays from the farebox. Enter Transportation for America’s new how-to guide, Thinking Outside the Farebox [PDF]. It breaks down the many options, delving into the pros and cons of a wide variety of funding and financing mechanisms. It explains why general obligation bonds are cheaper but riskier than revenue bonds, and why GARVEE bonds might be worth it, even though they’re essentially paid for with future formula funding. It points out that one big benefit of federal TIFIA loans is that you don’t have to start paying them back until five years after project completion, so you have a chance to get revenue coming in. And it notes that ballot initiatives to fund public transportation have a 70 percent approval rate over the past decade, but other taxes like those on special assessment districts can be controversial and hard to get passed. Several success stories show how expansions can be funded — but prove that it’s never easy. 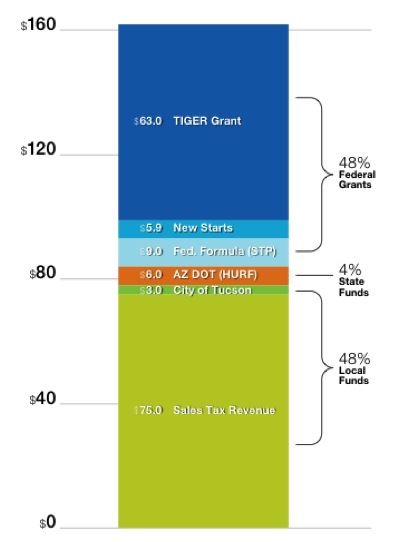 Tucson’s half-cent sales tax funds 35 new road projects, but also a modern streetcar connecting downtown with the university. Cleveland’s bus rapid transit line got federal New Starts money and competitive state funds. Los Angeles’ famous 30/10 financing plan for its major transit expansiona used an “everything but the kitchen sink” approach, combining TIFIA loans, sales taxes, bonds, formula funds — you name it. T4America recommends that agencies plan for operations as they figure out financing, since a shiny new rail line won’t do you much good without funds to keep it running. The report authors are also fans of scenario planning, a way to tease out potential benefits and drawbacks of various plans before implementing them, to save time and money. And they make the connection between system expansions and transit-oriented development, a great way to maximize transit investments and open up potential funding opportunities as the surrounding real estate gains in value. The Trump administration has slowed the release of federal transit grants to such a crawl that expansion projects in the works for years are now in jeopardy.